Oh, well, I’m sure you’re allowed to say happy birthday to yourself – well, happy blogiversary, that is. One year already – amazing. From snow to – hmm. Mud. In just one year, blogging has taught and brought me a lot, and I’m so grateful. Primarily, it has made me really look at my garden, and at the plants in it. Because I’ve rediscovered my passion for plants which had been somewhat overwhelmed by growing things to eat. I’ve also rediscovered my passion for photographing my garden, and that’s why this post is largely photographic – a celebration of the past year in my garden. Hm – primarily a celebration of last spring. It’s raining again, I’ve not been well for ages and I need cheering up. And it won’t be long (maybe next week, the rate some things are coming along in this unseasonal mildness) before some of the real joys of the garden appear. Maybe I’ve got a case of SAD? It wouldn’t be surprising; I’d love some nice, crisp, sunny winter days; get those walking boots on and get out into the hills without needing waders. Full body waders. Wellies will do for the garden. But spring flowers are always cheerful, and I defy anyone to be glum in the face of spring gorgeousness, like the fritillaries which come up in the meadow. The season may be haywire, but at least there’s no sign of these quite yet. I think: I haven’t actually looked in the spot where the earliest ones usually appear. Nor are the tulips showing, but they won’t be long. And then very soon I’ll be able to take a cup of tea and a book and sit on the bench, looking down the hill towards the dunes and the sea, and relax and enjoy the sun. Oh hang on, no I won’t be able to. I’ve planted a damson (well, an eirin bach, the local wild plum) near here which will block the view a bit, and the wood of the seat has rotted away in all this wet. Reality intrudes – but I can lay my hands on another chunk of wood, and who knows if the eirin bach will survive? And if it does, I’ll trade part of a view for lots and lots of jam. Here’s to the next year, and to all the great gardeners and plant lovers who have visited my garden – in both the real and virtual worlds! A nice positive post – congrats on concluding your first blogging year. It is always nice to look back on the previous year, as a memory jogger, and remember what the garden was like in its full glory. Thank you – and you’re so right; the retrospective view is soooooo encouraging! Here’s to good gardening year. I do so agree about the pleasures of communicating with gardeners from across the world, and non gardeners too. I can’t imagine my life without blogging any more. It would be trying to imagine a life without friends. Sounds as if we respond similarly to dank grey winter. I was reading a lovely blog the other day from someone who loves winter and found it hard to believe! I need some sun. I’m with you 100% – when it’s grim and gloomy here, ANZ gardens are full of fabulousness. Though that does make me want to get onto a plane. Now. Thanks Karen – the year turns and you can prune fruit trees even if it’s drizzling, so that’s what’s happening. But, but I’ve just found a brown crocus (did I plant that? Don’t think so…) so you can get good surprises even in January. Happy blogiversary to you, Kate! I’ve enjoyed reading your blog this year. Good to hear you’ve found it helpful with your gardening. Thank you too – I never ever anticipated how it would change my view of the garden… I think it’s exposure to everyone else’s lovely, plant-packed gardens: made me realise what I was missing! Hi Kate – Happy blogiversary to you! Wishing you joyful gardening in 2012 and beyond! Thank you! There are all sorts of unexpected benefits to blogging – and bearing in mind my terrible potato experience and crappy crop of previously reliable beans, perhaps it’s just as well I’ve developed a new perspective! Happy Blogiversary! Is that really a word? Thanks for the pics. of flowers in sunshine – this grey grim sunless weather makes it hard for even the most positive of optimists. The sun will come back, won’t it? I think it’s a word if we want it to be one… ho ho… The sun better come back. If it doesn’t, I shall go to Oz and fetch it! Thank you – isn’t it interesting how blogging affects our gardens? Most surprising – for me at least. Boy, do I know what you mean about the weather – the sun shone briefly yesterday, so I leapt out in it. Didn’t get very far before it all closed in again, though. Grumble. Happy blogiversary. It is a lovely little community in the blogscape. I’ve really enjoyed reading your posts, and look forward to more as the year unfolds. I am getting very excited about all the little nibs of green shoots pushing up where I planted my hundreds of various spring bulbs around the new and improved garden… Here’s to spring – and no sudden wintry freeze! Thank you – isn’t it a lovely community? Just goes to show that gardeners are a great group of people, and troll-free (I do hope I’m not tempting fate!). 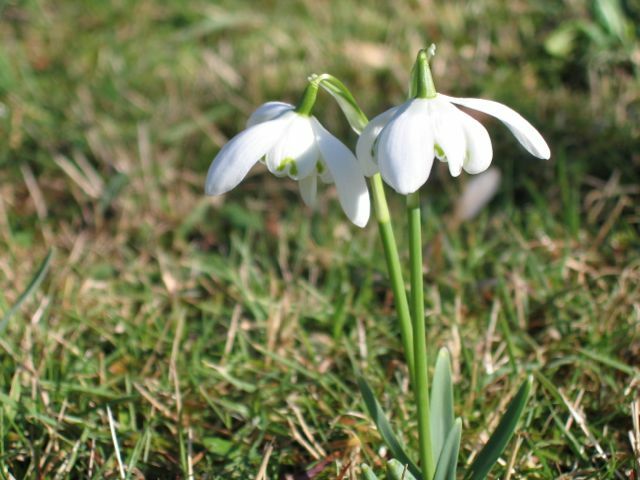 I fear that we may get the freeze at the end of the week, which will come as a horrible surprise to all the birds which are singing away madly in my garden – it’s not just the bulbs that think it’s spring… but here’s to spring anyway! Rain not going away just yet. ARGHHHHH. Dry? We’ve had glorious and sunny!! Got seriously overexcited (but not so overexcited that I began the Big Sowing). And sun is very good for the health… cheers you up, anyway!